Everyone who owns a cast iron pan knows two things. One, cast iron pans are great. And two, they are nigh impossible to clean. (We’ve all had to resist that temptation to put them in the dishwasher). 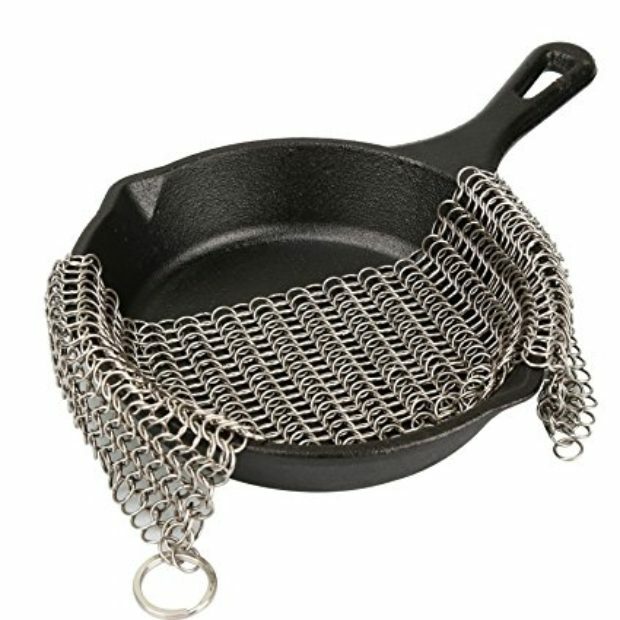 This chainmail scrubber is how to properly clean your cast iron pan. No scratching! It’s beloved by customers – 82 percent of the 850+ customers gave it a perfect 5 stars, leading to its enviable 4.7-star rating. And while I think we all would happily pay $50 to ensure proper cleaning of our cast iron, right now the thing is on sale for just $13. While this was obviously made with cast iron in mind, you can actually use it to clean a whole host of kitchenware: woks, baking sheets, teapots, pie pans, etc. Stainless steel, copper, glass, you name it, and this will get the job done. Just run your pan under warm water and scrub.